Nutrition | Kay Rice, M.Ed. I’ve used the term, “Eating Clean” for a long time. I didn’t even realize how common it had become until I saw the Clean Eating Magazine, which delighted me! Clean Eating means eating a diet that is made of Natural and Unprocessed Foods, free of added sugars, refined grains and other additives. When you eat a “Clean” diet the focus will be on fruits, vegetables, means and healthy fats in their most natural and unprocessed form That used to be pretty easy. Just cut out the refined carbs (sugar and flour) and processed food and get back to basics eating REAL food, as close to the way mother nature made it as possible. Well, as our commercial food supply has evolved things have gotten a little more complicated. How so yu may ask? Now, in order to get the “cleanest” most nutritious foods, the way mother nature intended us to have them, in addition to sugar & sweeteners (that go by a lot of different names—read my article on Sneaky Sugars in My Pantry), and refined wheat and wheat products (and wheat has become way over hybridized), there is GMO food, a ton of pesticides and much of our meat is raised and produced in a manner that doesn’t support or honor the life of the animal and we end up consuming the result of animals being raised in CAFO’s (Confined Animal Feeding Operations) which have been fed on GMO corn and popped full of hormones and antibiotics that are passed on to us in their meat or dairy products. Over the last 3 decades more and more people are becoming allergic, intolerant or sensitive to many of these mass produced crops. More and more of our population is becoming sensitive, intolerant or allergic to these over-hybridized, GMO crops, most of which by the way are subsidized by our government, which makes them CHEAP to produce. So … what t do? I’m going to lead you through some information and some steps that you can follow. Instead of eating pizza, pasta, bread, cereals and fried foods, a clean diet will consist of meals like steamed broccoli and grilled chicken, omelets, steak, baked potato and salads with dressings made with healthy fats. In essence, it’s going back to how we used to eat before there were grocery stores packed full of processed foods, ready to serve microwavable meals, and fast food restaurants on every corner. The idea behind eating clean is to get back to consuming fresh, unprocessed foods that are nutrient dense. In my mind, this includes avoiding foods with GMO products, added sweeteners, and foods that have been irradiated so they don’t spoil while they get shipped from other parts of the world to our local grocer. It may be impossible to eat local or organic foods exclusively, but the more you can, the healthier and more nutritious your food will be. The main reason for choosing to stick to a clean eating diet is to support your optimal health. As an aside, eating in this way also supports our local growers and farmers who grow crops and raise animals in a healthier environment, and in the end this supports having a healthier planet. How “clean” you make your diet is up to you. You have a lot of choices here. To some, eating clean may mean that they only consume completely unprocessed foods. Others may reduce or eliminate all food products with refined grains and added sugars and sweeteners. I’ve got a new definition and option for you. Pick 30 days, and eliminate all grains, legumes, dairy products & sweeteners. Yep, this will pretty much eliminate all processed foods, and most refined carbohydrates. In addition, it will eliminate most foods that are causing symptoms due to an intolerance or sensitivity that you may not even realize you have. This will eliminate not only all sweeteners, but corn & corn products, wheat & wheat products, soybeans, peanuts, vegetable oils. You may already be asking, “So what will be left that I can eat?” Just wait and see. There are so many really delicious food options to explore, and since I tried doing this I’ve discovered that I’m eating a more varied and delicious assortment of healthy foods. I’m naturally eating more protein, healthier fats and a bigger diversity of fruits and vegetables than before. You’ll be filling your plate with plenty of raw or cooked vegetables, including potatoes or winter squash, delicious meats and rounding it out with healthy fats and a little fruit. You may think it’s hard to find healthy snacks or meal replacements for when you are on-the-go, so I’m going to share with you some delicious options that I’ve found to keep in my Emergency Food Stash (EFS). My favorite meal replacement bars are now Rx Bars, with all REAL food; I’ve found some protein bars and sticks with REAL meat (EPIC Bars and Chomps Sticks, for an example), small packages of olives (for fats), and of course dried fruits, nuts and seeds. Most of these options even are organic, non-GMO, or come from Grass Fed Animals! When it comes to drinks, water and herbal teas are the best. I like to infuse my water with fruit. 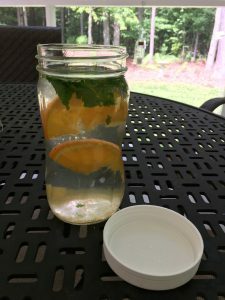 My favorite infusion is to add one slice each of lemon and orange to a 28 oz mason jar of water. Black coffee is another good choice (only it does not count towards your daily water intake since it is a diuretic), and I’ve found a couple of good non-dairy creamers. My favorite is a product called NutPods. It might take a few days to adjust, and you may even experience some symptoms as your body rids itself of all the added sugars and processed food products. Pretty soon though, you’ll be enjoying the benefits of eating delicious real food. In addition to some of the resources I’m giving you in this article, I’m going to give you some ideas that may help you when you start to miss your favorite processed foods. You may think that packing a lunch is hard when making a sandwich isn’t an option. And how are you going to go without bread or your favorite pasta. 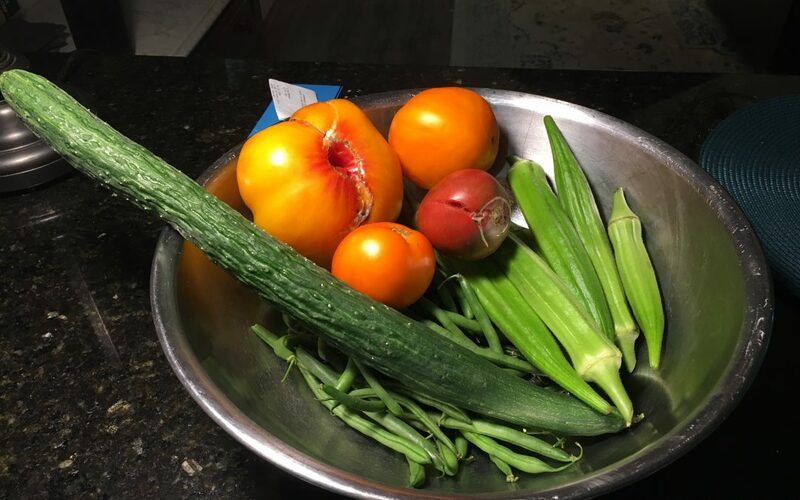 Real Food and Real Results “Real Food is Always Better than Fake Food!” This has become my signature statement for choosing healthful and nutritious foods. Mother Nature knew what she was doing when she created our food supply. The closer you can get you food to the way Mother Nature created it, the more nourishing and healthier it will be for your body. This means whole grains, locally grown fresh fruits and vegetables in season; foods that come without packaging or bar codes and only have one ingredient in them. Refined, processed and packaged foods, foods that have ingredients that you don’t recognize and can’t pronounce, foods that have additives and preservatives, or have been genetically altered (GMOs) or irradiated are not the best choices. If you choose real food over fake foods it will also eliminate the need for substitute foods such as diet sodas, low-fat dressings processed cheese food (not even real cheese). In general these diet foods have had something taken out of them and had it replaced with something even less healthy. So, whenever you have a question about the healthiest choice, or the latest fad, just remember: “Real Food is Always Better … “, and ask yourself, “How close is this food to the way Mother Nature created it?” One thing I’ve learned over the years is that our over-consumption of certain foods has made some individuals less tolerant of them. Add to that the fact that much of our supply of these foods has been genetically altered (GMO), they just are not as healthy and nutritious as they used to be. I learned a long time ago that although I am not “allergic” to wheat and wheat products that I feel much better when I avoid them. Don’t even get me started on food additives and preservatives. Many of us have “hidden” food intolerance or sensitivities to certain foods. These foods include wheat— which is not GMO but has been over hybridized—and all products containing wheat (even if it is whole grain), (corn and products derived from corn like corn syrup), peanuts and other legumes, soybeans and soy products (now mostly GMO) & dairy products (most cows consume GMO corn). I like the plan that I follow and recommend to others because it can “meet people where they are” with regard to food quality and what they are used to eating. However, the goal is to get people eating consistently in a way that manages their blood sugar, and when they start feeling better, cravings are reduced, and they are experiencing other positive results, it becomes easier and easier to make healthier choices. Virtually everyone, including fitness models, when they eat the highest quality meals will eliminate these foods from their diet when they want to be their leanest, healthiest and have optimal energy. My recent research shows that between 70-80 percent of the foods we purchase in stores have GMO foods in them. Top GMO’s include corn, soy, canola oil (rapeseed), cotton, milk, & sugar. And Aspartame comes from a GMO bacteria! YUCK! My achy joints stopped aching and my digestion and elimination is better when I don’t eat wheat, flour, pasta or any wheat containing foods. If you have a food intolerance or sensitivity you may not even know it. The easiest thing to do is to eliminate all of those foods that are suspect for 30 days and then try re-introducing them one at a time to see what effects they have. Calories in and calories out! We’ve been told that all we need to do in order to reach our weight loss goals is to create a calorie deficit. That sounds so simple, but obviously there is more to it or most of us would already have permanently achieved our weight loss goals. With more than two thirds of the United States Population overweight, and a large percentage obese, clearly there is more to the story! How many of you have lost weight only to gain it back? How many of you seem to start a diet every Monday only to have fallen off or become frustrated before the end of the first week? How many of you seem to find it impossible to lose weight? I know because I have had all of those experiences! I felt as though every time I tried to “cut a calorie” here my body seemed to find it somewhere else. In fact, over time I continued to GAIN weight instead of losing weight, even through I was making pretty healthy food choices and exercising. What the heck? Since my education was in Exercise Physiology, I was really beating myself up because I believed I was supposed to have the answers and be healthy and fit. What I needed to know I had not been taught in college – even at the Masters level. Ironically, when I finally DID learn how to fuel my body correctly I recalled that one of the basic principles I’d learned in 7th Grade. I’ll tell you what that was later. For now, I’m going to help you understand WHY many of the diets you may have tried have not worked. We have heard for years that a calorie is just a calorie; that all calories are created equally and that if you want to lose weight all you need to do is just burn more calories than you take in. Anyone who has struggled with their weight for very long will certainly agree that they have discovered that it is just not that simple. If it were, we would not have the obesity problem that we have today. Our hormones have a LOT to do with how we metabolize our food! What else matters? When we eat, how much we eat at a time, how long we go between eating, and the type and quality of the calories we are consuming all make a difference in how our bodies respond to the calories we consume. Often people trying to lose weight inadvertently keep their bodies in “fat storage mode” by going too long between meals, then eating too many calories at once, and of then the wrong kind of calories. This ultimately prevents weight loss success and slows metabolism. 1. Not eating breakfast. Yes, your mother was right – you need to start your day with breakfast. You should eat within an hour upon waking up. When you haven’t eaten all night your blood sugar will be on the low side. Eating a balanced breakfast will give your body the fuel it needs and jump start your metabolism for the day. 2. Going too long between meals. When you wait too long between meals you will become over hungry. Starving all day sets you up to over eat, or eat the wrong things when you do finally eat. When you eat this way it affects your metabolism and large meals eaten infrequently encourage fat storage. Eating small frequent meals during the day will help sustain your energy level, improve metabolism, and encourage fat burning. 3. Not drinking enough water. It is not uncommon to mistake thirst for hunger. When you don’t drink enough water your body actually starts holding onto water. Seems like the opposite should be true but it is not. You should drink a MINIMUM of 64 ounces of water per day or half your body weight in ounces. For example a 150 pound person should drink at least 75 ounces of water per day. 4. Not having a plan. We don’t plan to fail we fail to plan. When you are trying to reach a new weight or level of fitness you need a plan to follow. It takes some advance preparation to make certain you stay on the plan. Carry food with you and have a backup plan for emergencies. 5. Binging after you have eaten off your plan. Don’t wait until tomorrow to get back on track. We all fall off of our plan from time to time. What matters most is how fast you get back on track. Make it your goal to lengthen the amount of time between the times you fall track and shorten the time you jump back on after you have fallen off. 6. Believing you are genetically destined to be overweight. Some of us are more predisposed to gain weight, but the major factor in whether you are carrying around excess weight is how you you’re your life. Your lifestyle choices have more to do with how much you weigh than your genetic make up. 7. Eating processed or substitute foods. Real food is always better than fake food. Eating foods as close to the way they were grown as possible is the best way to support optimal health. Processed foods often contain ingredients that you don’t need or are unhealthy for your body. Often “substitute” foods contain unhealthy chemicals and toxins your body would be healthier without. As for those diet sodas … even artificial sweeteners can cause an insulin reaction in your body and they contain a lot of unhealthy chemicals. Eat local and fresh fruits and vegetables in season whenever possible. 8. Being too attached to your scales. I’ve said it a million times, “The scales are not your friend!” Weigh at the same time of day with the same amount of clothing. The scales aren’t always the most accurate measure of whether you are consistently losing fat. Some experts recommend weighting only once a week. I like to weigh daily, first thing in the morning when I’m working toward a new goal. Your scales are not the only measurement of results. One month, when I began resistance training, I lost an entire size in my jeans without losing a pound on the scales. What did that mean? I lost body fat and gained lean body mass (muscle)! If I had gone entirely by the scale I’d have felt frustrated, while in reality my body changed in a very positive way that month. 9. Not eating enough food. Eating a lot less or going on a crash diet will not achieve the results you want. This strategy results in lowering metabolism and losing both muscle and fat. Total calories are important, but so are the amounts of protein, carbohydrates and fats in the diet, and the frequency of your meals. Never go on any diet that is not a manner of eating that you can adhere to for the rest of your life. In addition to losing excess body fat you want to develop healthy habits that will promote your optimal weight and health for the rest of your life! Don’t think that going on a temporary “diet” will give you lasting weight loss results. If you want to change you life your will need to change some habits so you can sustain your results long term! Trust the process. 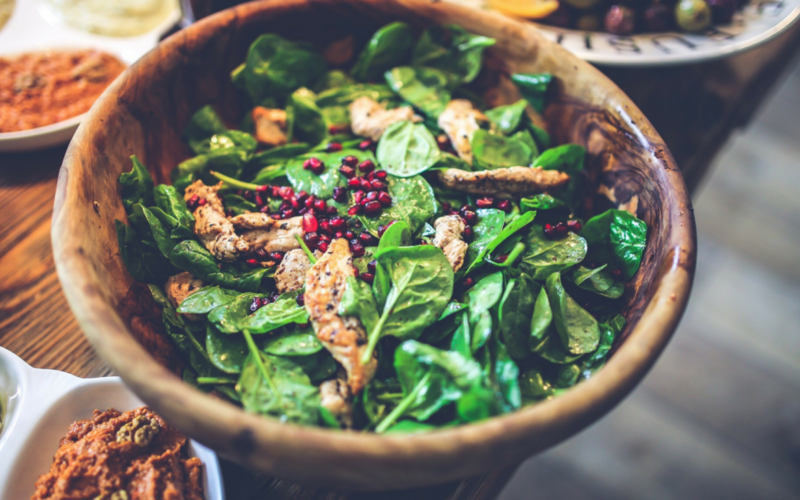 Once you begin to eat in a more healthful way you will not only see but feel the results, and you will likely choose to continue more healthy lifestyle habits! It won’t be a matter of forcing yourself into what you “should” be doing—you will genuinely want and enjoy your new choices! It’s surprising that one of the biggest challenges I hear from people doing the 90 Day Challenge is drinking the daily amount of water that is recommended. It is recommended that each person drink half their weight in ounces each day—for example someone weighing 150 pounds should set as a general goal to drink at least 75 ounces of water each day. 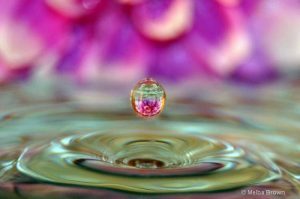 I’m going to explain here why water is so important and then share some tips with you. Drinking enough water is vital to your health and your nutrition plan. While individual needs vary, a “rule of thumb” is to divide your weight by ‘2’ and that’s the amount of water a sedentary person of that size should drink in ounces each day. Water is easily the single most important nutrient for our body. We can survive for several weeks without food but only a few days without water. Water aids in cell metabolism, helps remove toxins from our body, and helps to regulate body temperature. Keep a water bottle handy and sip generously throughout your day. Next to air, water is the most necessary element for our survival, yet it is likely the most underestimated of the essential nutrients. We can live without eating food for several weeks, but we can only survive a few days without water. The typical adult body is made up of 60 to 70 percent water. Water provides the body with form and structure, known as turgor; it provides the fluid environment for all cell metabolism, and it regulates the temperature of the body. Water is essential for elimination, breathing, digestion, and joint lubrication among other things. Is there a link between Hydration and Hunger? Studies say yes, thirst can be mistaken for hunger. There is evidence of a correlation between the thirst and the hunger drives in the brain. Even in cases of mild to moderate dehydration sugar and food cravings have been observed. In addition, if you are trying to lose weight drinking adequate amounts of water is essential for efficient fat metabolism. Not drinking enough water can cause water retention because the body will try to hold onto water to compensate. Often drinking more water will solve the problem and your body will release the excess water. Other effects of even mild to moderate dehydration are increased back and joint pain, daytime fatigue, headaches, and a decrease in motor skill abilities, concentration, and memory retention. Chronic dehydration can even lead to an increased risk for kidney stones and some forms of cancer. Surprisingly few people know how much water they need to consume on a daily basis for optimal health. It is estimated that a significant percentage of our population, as much as 40% or more, is chronically dehydrated. Daily requirements to stay hydrated will vary based on the size of the individual, their activity level, as well as the temperature and humidity of the environment. The higher the relative humidity or the more moisture that is in the air, the more difficult it is for the body to regulate its temperature during exercise. You will actually perspire more when the humidity is high. Consequently, you will need to drink more water to stay hydrated. If you drink caffeinated beverages, exercise vigorously, or it is extra hot or humid this will increase you need and you should drink additional water. If you wait until you feel thirsty, then you are already slightly dehydrated. There is one true test. If when you use the restroom, if your urine isn’t clear you need to drink more water. I recently spoke at an event where we looked at the effects of dehydration on soft tissue (or muscle). Even slight dehydration reduces muscle flexibility, causes stiffness, and if you are getting massage therapy make your body a lot harder to work on and accept the benefits of that therapy. A more accurate estimate of daily water requirements would be to drink ½ to ¾ of an ounce of water for each pound of body weight. The lesser amount would suffice for an inactive person, and the greater amount would be appropriate for someone who is active. So an inactive 150 pound adult should consume a minimum of 75 ounces of water per day. Add 16 additional ounces for strenuous activity and another 16 ounces if it is hot and the relative humidity is high. So this brings the total up to 107 ounces per day! Divide this amount by the number of hours you are typically awake to find out how much water you should drink each hour since you should consume your water intake through out the day. In our example, this individual should drink approximately 9 ounces of water each hour they are awake. Still, this is just a guideline, actual requirements can vary. There are several factors that can cause water retention. Frankly, if you are too attached to the numbers on the scale then this can cause frustration. I think it is best to know what things may cause you to retain water weight and then the temporary number going up on the scale will not be so alarming or frustrating. If you eat a meal with high sodium content this can cause water retention. This could be from eating anything from sushi to packaged and processed foods to eating out in restaurants where typically the sodium content will be higher than when you prepare your own foods at home. Other causes for water retention can be consuming more carbohydrates than normal, not getting enough sleep, or for women who are menstruating, the time of the month. This sounds counter-intuitive or crazy, but not drinking enough water will cause you to retain water, too. How in the heck does that happen? Well, if you aren’t drinking enough water the body starts conserving water by recycling it instead of releasing it. This is not a good thin, not only because you are retaining water, but because your body releases toxins when it releases water—and that is a good thing! Yes, it is possible, but not likely. Water Intoxication (Hyponatremia) can occur when someone drinks too much water very quickly and their kidneys cannot excrete the excess, which can cause sodium levels in your blood to drop too low. However, this condition is rare. Endurance athletes such as marathon runners are at greater risk because they consume large amounts of water quickly. Healthy adults consuming a normal diet have a very low risk of water intoxication. So How Do I Drink All That Water? The key is to drink water often and throughout your day. Keep a container of water with you wherever you are. Generally I have a “favorite” water bottle. 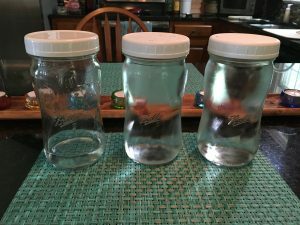 Right now, I have several favorite water bottles—I have a set of spiral shaped 32 ounce wide mouth mason jars—I fill three of them up each morning, a total of 96 ounces. This is my daily target of half my weight in ounces plus I add some to offset my morning coffee (If I drink 16 ounces of coffee in the morning, then I need to add 16 ounces of water during the day since coffee is a diuretic.) When those jars are empty, I’ve met my target for the day. I avoid purchasing individual, disposable water bottles. Purchasing water that way is expensive, and all those disposable plastic bottles are not good for the planet, either. I do purchase filtered water by the gallon because the well water where I live doesn’t taste good and goes through a water softening system. I’ve noticed that the plants like rainwater better than the water from my well and I figure if it’s not good for the plants, then it probably isn’t the best choice for me either. For variety, I like to infuse my water with fruit or herbs. Make certain you are well hydrated before exercising and remember to drink water during your exercise sessions. Be sure to re-hydrate when you have finished your exercising. Right now my favorite infusion is a simple one. I add one slice of orange and one slice of lemon to a 32 ounce jar of water. Other infusions to try: cucumber slices and fresh mint from the garden. Apple slices and mint works well, too. 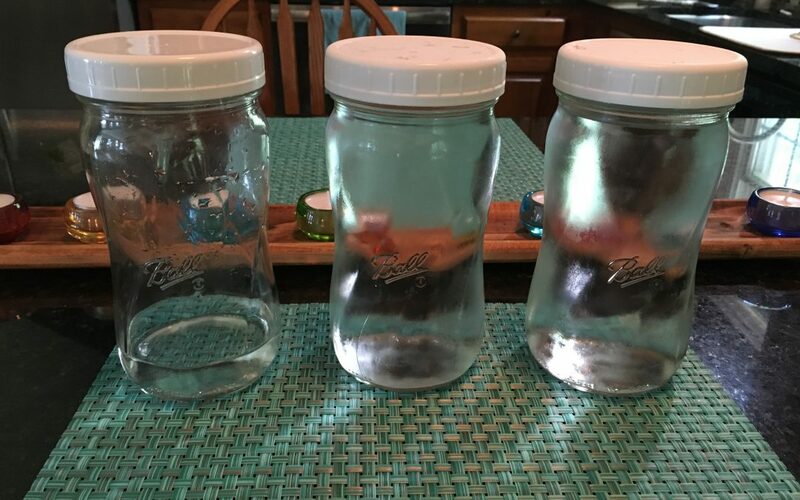 If you have an extra chunk of watermelon, toss it into one of your jars of water. Infusions give your water a subtle taste without adding significant calories or sugar. Also, having colorful chunks of fruit, herbs, or cucumber make your water look more refreshing and appealing. It’s all in the presentation!